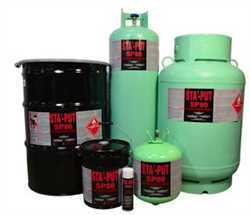 STA’-PUT® SP80 is a solvent-based, low VOC, non-chlorinated contact adhesive specifically formulated for bonding high pressure laminate to particleboard and many other porous & non-porous surfaces. SP80 provides high solids, and a water resistant bond, and also exhibits high strength, aggressive grab, and quick tack. SP80 is also available in an aerosol can for laminate repair and edge banding. This product is also available in a canister system that provides a smooth spray pattern and reduces telegraphing on thin laminates.